Del Close played Polonious once in Hamlet, and won a Joseph Jefferson Award for it. But the role he really wanted to play was Yorick. He had to die to do it, but now he may get his wish. Under the terms of his will, Close, who died March 4 1999, has left his skull to the Goodman Theatre. 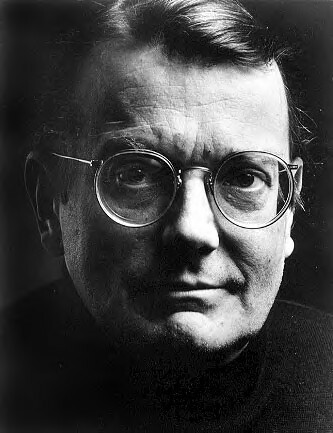 Del Close was born and raised in Manhattan, Kansas and attended Kansas State University, after touring with a side show act for a period of time in his teenage years. In 1957, at the age of 23, he became a member of the St. Louis branch of the Compass Players, the direct precursor of The Second City, which opened in December, 1959. Most of the St. Louis cast went to Chicago, but Close chose New York and a budding career as a hip, young stand-up comic in competition with Lenny Bruce, George Carlin, Bob Newhart, etc. That same year he also appeared in the Off-Broadway musical, The Nervous Set, of which an original cast album exists. Close came to Chicago in 1960 and more or less made it his home for the rest of his life, always gravitating back there after a few months or even years elsewhere. Close directed and performed at The Second City until he was fired (major substance abuse problems) in 1965. He spent the next five years in San Francisco eating acid and touring with the Merry Pranksters on their famous psychedelic bus, creating light images for the Grateful Dead, and working with The Committee, a North Beach equivalent of Second City which Close helped organize. It was at The Committee that he first began seriously to develop his ideas and techniques of long-form improvisation, although Second City had experimented with long-form as early as 1962. Close returned to Chicago in 1970, and set up a free, open-to-all workshop at the Kingston Mines Company Store, the cafe attached to the Kingston Mines Theatre Company on Lincoln Avenue (where the parking garage of Children's Memorial Medical Center now stands). He drilled his students - everyone from acid-dropping love children to a vice-president of the Foote, Cone and Belding advertising agency - in the basic principals of improv and theatre games, and in the specifics of "The Harold", a long-form improv technique developed by Close. The weekly public performances at Kingston Mines sometimes had as many as 20 performers participating. After a few months, Close hand-picked a dozen of his best, and moved operations down the block to the Body Politic for twice-weekly workshops and Sunday night performances. He named the company the Chicago Extension Improv Company, as an extension of his San Francisco work. The best-known players to emerge from the troupe were "Broadway" Betty Thomas, Dan Ziskie, Brian Hickey and Jonathan Abarbanel. Before leaving Chicago again in 1972 to perform for Paul Sills in a Story Theatre production at the Mark Taper Forum in LA, Close and the Chicago Extension had begun to explore scenario improvs based on dreams. The techniques the Extension developed after Close left became Dream Theatre, which continued at the Body Politic over the next five years, although with different personnel. Close returned to Chicago in 1973 as resident director at The Second City, a position he kept until 1982. It was during this decade that he taught and directed a long list of TV and film comedy greats including John Belushi, Bill Murray, John Candy, Don DePollo, George Wendt, Audrey Neenan, Eugenie Ross-Lemming, David Rasche, Shelly Long, Anne Ryerson, etc. Upon leaving the troupe, Close pursued legitimate acting opportunities with a number of theatres, including Wisdom Bridge, Remains, Goodman and Steppenwolf. He won his Joseph Jefferson Award in 1985 in a radical Hamlet directed by Robert Falls at Wisdom Bridge. Close also did TV and film work, appearing in "The Untouchables" and "Ferris Beuler's Day Off" among others. It was during this period that Close finally beat his long heroin addiction (although he continued to smoke cigarettes and marijuana), in part truly shocked by the excesses and death of John Belushi, and in part because, as he told Jonathan Abarbanel, "I've decided I want to live." Close was enjoying his new theatrical vistas, as well as a successful professional partnership with Charna Halpern and ImprovOlympic, which allowed him to concentrate on further development of The Harold, and on team improv. Close was 64 when he died of complications due to emphysema the evening of March 4, 1999, just five days shy of his birthday. He left no survivors, although he claimed to have fathered an illegitimate child by a woman in Minneapolis sometime in the late 1950's. His body was cremated, as he wished. His skull is expected to be given to the Goodman Theatre to await the company's next Hamlet. Close was one of three titans of improvisational theatre who put it on the map, refined it, and turned it into the fixture of comedic and acting technique which it has become. Close became the third titan of improvisation, after Spolin and Sills, and the only one to devote his artistic life and best theoretical thinking to it. He fully understood pain and suffering as a basis for comedy, as well as the nature and limitations of the comedic form. The Harold, the scenario, long-form improv - call it what you will - is his personal legacy to the field; while his own boundless, sometimes manic drive as a charismatic teacher and director have done more to establish improvisational theatre around the world than anything or anyone else. The explosion of improv troupes and teams and classes (the Museum of Contemporary Art offers an improv class, for example), and the inclusion of theatre games and improv exercises in standard acting curricula, are the result of the work of Spolin and Sills and Close. With specific regard to long-form improv and Close's own contribution, that legacy will grow even greater through the next generation, as his students and acolytes inherit the world of comedy. Contributed by Stephen Montagne, who found it in the Internet Movie Database.